38,000+ preloaded international courses, along with free course updates. Does not have an activity monitor. Performance Rating: 4.2 of 5 stars. The Garmin Approach S5 GPS golf watch is another golf GPS from Garmin loaded with great features. 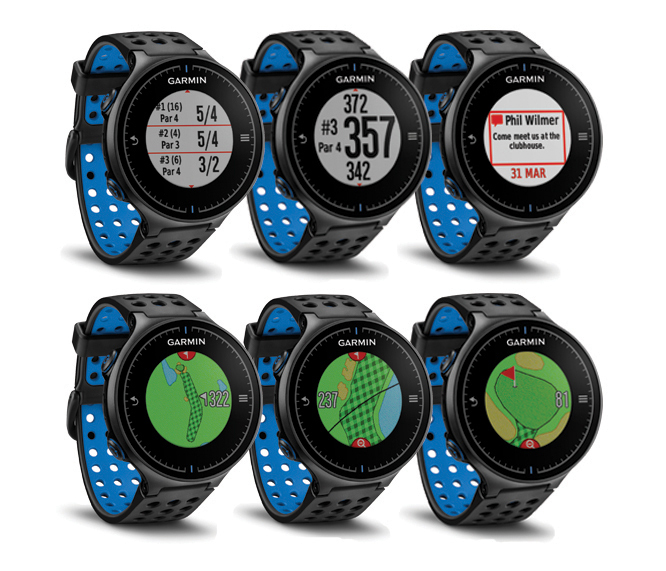 While this model is very different from other Garmin Approach models and is more on the high end side, it is remarkably similar to the Garmin Approach S6 in its form and functionality. It is also smaller and lighter than the S3 and S4, but has a color touchscreen. 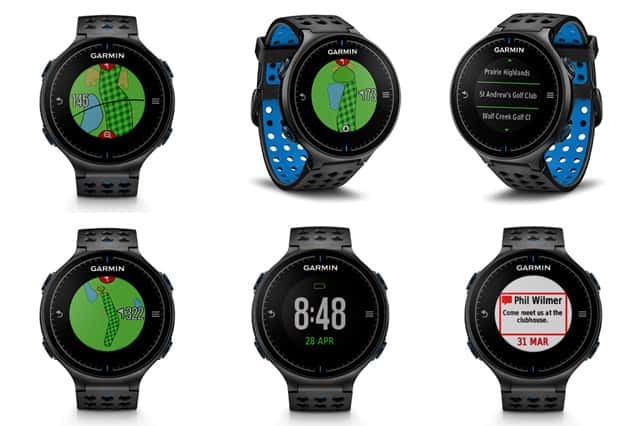 While the S5 lacks the pin-pointing and tempo tracking features the Garmin Approach S6 has, it still has over 38,000 preloaded international courses, layup arcs, scoring and stats, yardages to the green, smartphone notifications, and the cross-platform Garmin Connect portal. 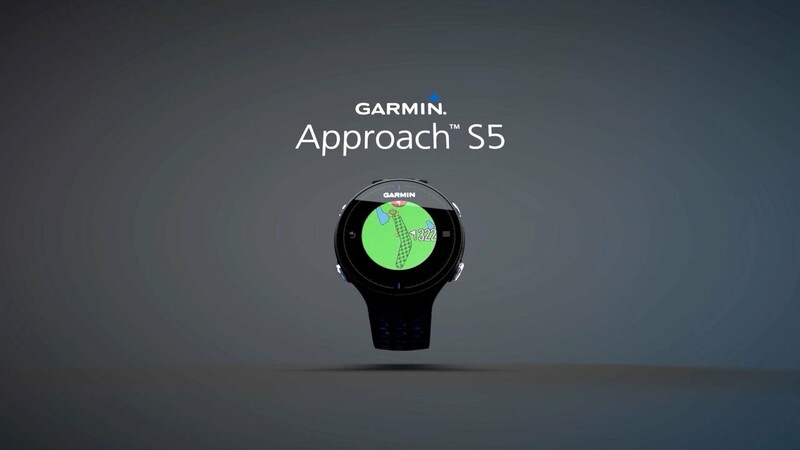 With full course views and being able to select any point on the hole to read the distance, the Garmin Approach S5 is a very useful tool to have on you when golfing. More than 38,000 preloaded international courses, along with free course updates. Touch targeting allows users to zoom into any location and gauge yardage to any position on the hole. Smart notifications for email, texts, and other alerts. Battery: 20 weeks in watch mode. Battery: 10 hours in GPS mode. The Garmin Approach S5 gps golf watch is obviously a great asset to have on your person when wearing golf, but how worth it is it really of its $350 price tag? That all depends on what you are looking for in functionality. As far as the performance of the Approach S5, there are some features that work well and others that still need some user interface tinkering by the Garmin team. One of the most common complaints about the Approach S5 is that the battery life isn’t necessarily up to par. This issue is not just one concerning Garmin products, it concerns all products in the wearables industry. Although advertised as lasting for around 10 hours on GPS mode, the Approach S5 life often gets dicey after the first round. Other than that, the GPS accuracy (one of the biggest sources of scrutiny in all golf GPS watches) is near perfect. Provided you have this thing charged, it will function to its fullest abilities rain or shine. The rounded face of the Garmin Approach S5 makes it a favorite among the world of rectangular wearables. While it does come down to a matter of preferences, I believe it looks much sleeker and could easily be mistaken for a high quality ordinary wristwatch. The powerful functionality all loaded into the small, color screen makes it a very cool gadget to have around. There are few complaints about the fit and comfort level of the watch. It’s band comes in a sporty black or blue. For the price point it is, the Garmin Approach S5 feels like it is an expensive piece of equipment. In comparison to some golf watches you can get for $75 that don’t even feel like $75, the seamless Garmin Approach S5 aesthetic really excels in the design department. The Garmin Approach S5 golf watch is packed with all the great Garmin features, except for the activity tracker. The ability to estimate distances by placing pins is a feature many golfers look forward to when using the Garmin Approach S5, as well as the features that mark hazards, traps, doglegs, and other problematic areas across the course. You know that feeling of getting stuck in a trap not because you didn’t get a good swing, but because you didn’t know it was there? That can all be avoided with a Garmin Approach S5. One of the missing features on the Garmin Approach S5 (as well as the Garmin Approach S6) is the lack of an activity monitor. It seemed like Garmin really intended this watch to be something for golf use only. While it is a phenomenal tool to be on the golf course, if you wanted something with a wrist heart rate monitor or activity tracking, check out the Garmin Approach S20 or the Garmin Approach X40. The Garmin Approach S5 is around $50 less than it’s brother the Garmin Approach S6, but still has virtually all the same features at $350. While the battery life is a cause of concern for some golfers, it shouldn’t be an issue if an active effort is made to charge it before rounds. Obviously if you leave it in your golf bag for a few days before you go golfing again, it might not work. $350 is on the upper end of golf watch price, but the Garmin Approach S5 delivers on the accuracy statements for its GPS alone. You can check out other reviews and find the best pricing options at none other than Amazon.com. Thanks for checking out our Garmin Approach S5 review. If you found this information helpful, please share with others so they can too!